During October, Richard Downs, an elder of the Alyawarra-speaking community from the Northern Territory township of Ampilatwatja (300km north-east of Alice Springs) toured major eastern Australian cities to raise support for a protest camp established 3km from the township. A group of 30 elders and leaders from Ampilatwatja had set up the camp after walking off their land on July 14 to protest against the racist Northern Territory Emergency Response (NTER) being perpetrated against their and other remote Aboriginal communities by the Rudd Labor government. Downs’ tour has not only raised awareness about the suffering of Aboriginal people under the NTER, but it has drawn financial support from some unions allowing the Alyawarra to begin building a more permanent and sustainable community outside the bounds of the NTER. While the NTER was sold to people in 2007 by the Howard Coalition government and the federal ALP leadership as a “tough love” solution to an alleged wave of child abuse and the shortage of housing and other basic amenities in impoverished Aboriginal communities, in reality the NTER has done nothing but strip away what little control these communities had over their affairs. Both the Howard and Rudd governments have used the NTER to bully the communities into signing their land over to the NT and federal governments with 40-90 year leases. Since the introduction of the NTER two years ago, neither the federal nor the NT government has built a single house in any community. The NTER and Northern Territory Housing management of Ampilatwatja has done nothing to fix sub-standard housing or broken septic systems that leak ankle-deep raw sewage into some houses and into a playground. In May the government shut down the community-run store. At an Aboriginal Rights Coalition public meeting in Brisbane on October 17, Downs spoke about the results of his visits to Melbourne, Sydney and Canberra, which had raised the projected $20,000 required to sink a water bore at the campsite, with most of the money coming from supportive trade unions. Downs told the Brisbane meeting that unions were also helping to set up a water pump and a shower and toilet block that will run on solar power. There are also plans to begin erecting permanent buildings also running on renewable energy and the community has received offers from permaculturalists to establish self-managed food sources for the camp. The walk-off and support from unions and non-Aboriginal people in the eastern states is drawing comparisons with an earlier milestone struggle for Aboriginal land rights. On August 22, 1966, 200 Aboriginal stockmen of the Gurindji people and their families walked off the Wave Hill pastoral station in the NT, owned by a British aristocrat Lord Vestey. Conversations between these stockmen and Dexter Daniels, the Australian Workers’ Union Aboriginal organiser, about their low wages and poor working conditions, had led to the walk-off. Led by Vincent Lingiari, the stockmen set up camp in a river bed (Victoria River). The camp moved before the wet season of that year and in 1967 the Gurindji people settled some 30km from Wave Hill Station at Wattie Creek (Daguragu), in the heart of their traditional land, near a site of cultural significance. 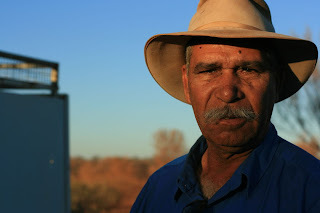 The Gurindji strike soon developed into a struggle to reclaim some of their land. Well-known writer and socialist Frank Hardy helped raise the Gurindji's cause through Communist Party and union contacts. The strike lasted from 1966 to 1975 and during this time Lingiari, Billy Bunter Jampijinpa and others toured Australia, with the support of unions, to address public meetings and build support for their cause. What turned the tide for the Gurindji was their own determination to stand their ground. This impressed non-Aboriginal working people who in turn brought pressure to bear on capitalist politicians to act. In 1975, the Whitlam Labor government, under pressure from a growing Aboriginal land rights movement, finally negotiated with Vesteys to give the Gurindji back a portion of their land. Dagaragu would eventually become the first cattle station to be owned and managed by an Aboriginal community, today known as the Murramulla Gurindji Company. Since the British invasion in 1788 to this day, the suffering of Aboriginal people has always been directly linked to the theft of their land. Even after the land was forcibly seized and secured by the military and police, the fact that Aboriginal people continue to assert their ownership of their lands continues to pose a problem to Australia's capitalist rulers. It is no coincidence that the latest government-run attempt to dispossess Aboriginal people of their land is concentrated in NT. Before the NTER began, 45% of the NT’s land and 80% of its coastline was owned by Aboriginal communities. The NT also represents a stronghold of different Aboriginal cultures with Aboriginal people making up 75.6% of the population outside of major towns. Almost all speak an Aboriginal language as their first language. Through their walk-off, the Alyawarra are providing an example of resistance to cultural genocide for other Aboriginal communities under the yoke of the NTER. They are also providing an example to all working-class people that resistance to the oppressive policies of capitalist governments is possible. To support the Alyawarra or for more information, visit http://interventionwalkoff.wordpress.com.